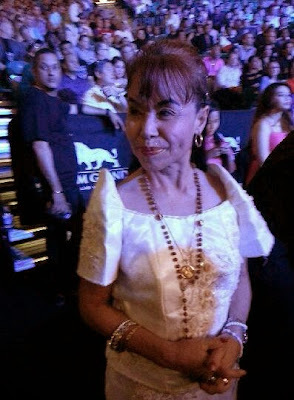 Home BOXING DIONISIA PACQUIAO MANNY PACQUIAO PACQUIAO VS BRADLEY SPORTS TIMOTHY BRADLEY Timothy Bradley loses fight vs Manny Pacquiao: Was Bradley hexed by Mommy Dionisia? Timothy Bradley loses fight vs Manny Pacquiao: Was Bradley hexed by Mommy Dionisia? 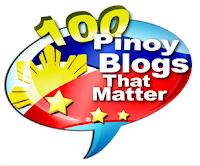 Manny Pacquiao's 2nd fight vs Timothy Bradley Jr. has just ended, and the Filipinos around the globe are celebrating for the huge win of Manny, regaining his WBO Welterweight title which he lost to Bradley in June 2012. 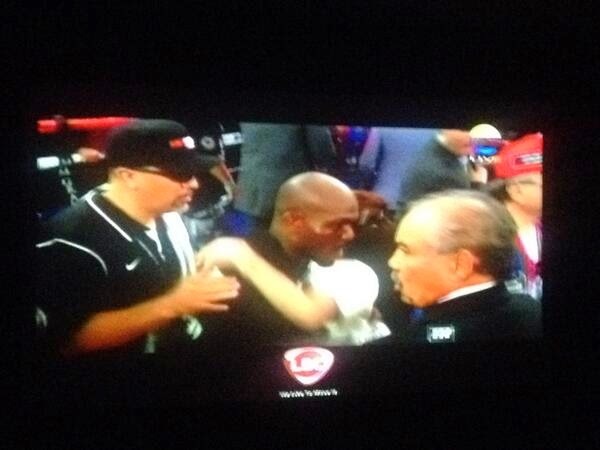 It was a vindication for Manny who should have been the winner in that controversial 2012 fight against Bradley. The rematch fight was held at the MGM Grand Garden Arena in Las Vegas, and the scorecard result says that Manny Pacquiao won via unanimous decision, the clear winner for all 3 judges: 116-112, 116-112 and 118-110. Not like the 2012 fight which had Bradley winning via split decision: 115–113, 113-115 and 113–115. And if there's one person who's the happiest for Manny's victory, of course it's his proud mother, Mommy Dionisia, who came to the event wearing a pure white terno dress. 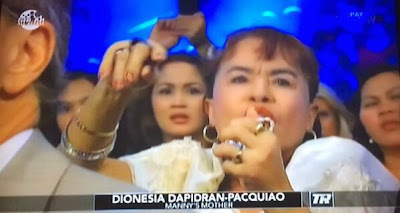 Mommy D was somehow a scene-stealer while sitting on the ring side when she was focused on the camera many times, praying so hard for Manny. She was holding a prayer card and a rosary, and she looked like she was casting a hex spell on Bradley. At the end of the fight, after the announcement that Manny won, Mommy D rushed to the ring and was seen comforting Bradley by giving him a hug. Oh she's still sweet despite what she did! lols. 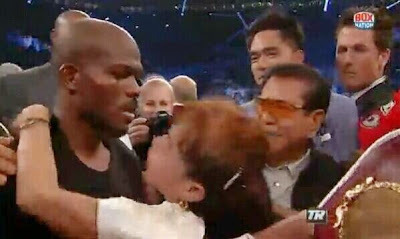 Bradley is lookin' like he was hestitant to get a hug from Mommy D, isn't he? It was his first ever loss, and definitely he's having a hard time absorbing what happened.